People without a religious affiliation – including atheists, agnostics and those who describe their religion as “nothing in particular” – are among the most educated of the world’s major religious groups. Globally, the vast majority (92%) of unaffiliated adults ages 25 and older have at least some basic education, nearly seven-in-ten (68%) have at least some secondary schooling and 16% have post-secondary degrees. While religiously unaffiliated people, sometimes called religious “nones,” are grouped together for analytical purposes in this report, in some cases, there are important differences within this group (see sidebar later in this chapter). The Asia-Pacific region is home to a majority (76%) of the world’s unaffiliated population – about 858.5 million people – and most of them (700.7 million) live in China. Just under two-thirds of all unaffiliated adults ages 25 and older in this region (64%) have at least a secondary education, but in the youngest generation in this study, that figure jumps to 89%. Sidebar: Does more education lead to less religion? Some scholars have hypothesized that as education levels increase, many people will shed religious identity and turn to science or other nonreligious sources for answers to life’s most important questions.19 If this secularization theory is accurate, one might expect that countries with higher levels of education would have larger shares of people who do not identify with a religion, and that, on average, religiously unaffiliated people (sometimes called religious “nones”) would have higher levels of education than those who identify with a religion. This study provides mixed evidence; there is some global data that seems to support secularization theory, but at the country level, the pattern is murky. At the global level, religiously unaffiliated adults are more highly educated than affiliated adults (as measured by average years of schooling). On average, religiously unaffiliated adults have 1.3 more years of schooling than religiously affiliated adults (8.8 years vs. 7.5 years). 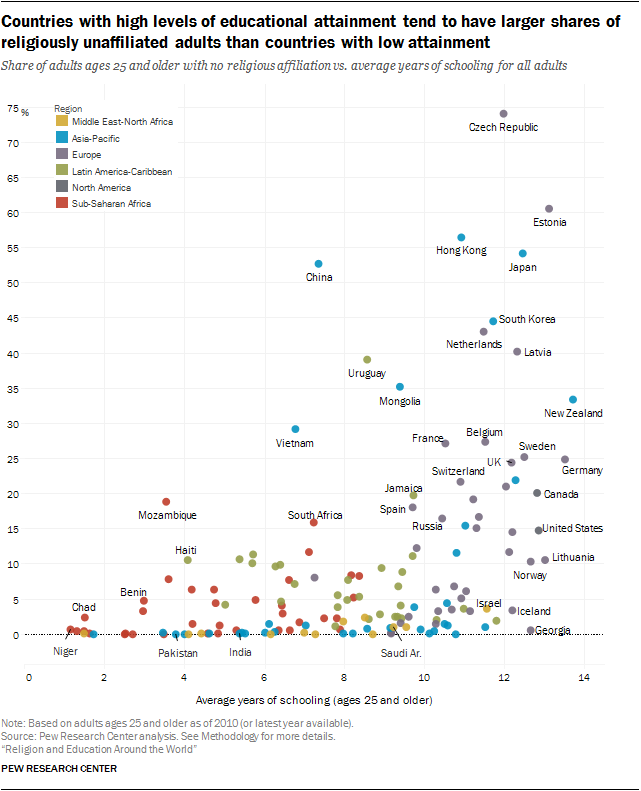 Why do religious “nones” have an educational advantage when viewed at the global level? One reason is that they are disproportionately concentrated in countries with relatively high overall levels of educational attainment. Large shares of the global unaffiliated population reside in highly educated countries such as Japan, South Korea, the United States and the nations of Western Europe. By contrast, relatively few religiously unaffiliated adults live in sub-Saharan Africa, which is the region with the lowest overall level of educational attainment. The global population of religiously affiliated adults shows a different pattern: It is more spread out across countries that have all levels of educational attainment. 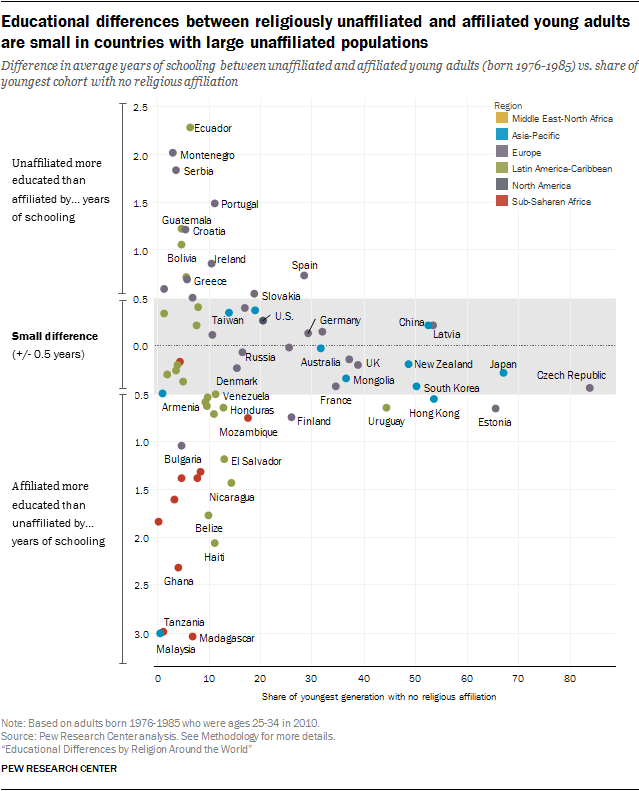 Individual countries with high educational attainment also tend to have relatively large shares of religiously unaffiliated adults compared with countries with lower attainment. There are countries that break this pattern, however, and have relatively small shares of unaffiliated adults despite high educational attainment (for example, Georgia and Israel). And China is also a clear outlier: Although educational attainment is relatively modest (7.4 years of schooling, on average), more than half of Chinese adults do not identify with a religious group. Indeed, when affiliated and unaffiliated adults are compared within countries, religious “nones” do not consistently have an educational advantage, especially among those in the youngest generation.20 There are 76 countries in this study with data on the youngest generation (born 1976 to 1985) of religiously unaffiliated adults. In 32 of those countries, religious “nones” in this generation have a similar number of years of schooling as their religiously affiliated peers (a difference of less than half a year of schooling). In 28 countries, the unaffiliated are less educated than the affiliated by at least half a year of schooling. And in 16 countries, the youngest “nones” are more highly educated than their religiously affiliated compatriots by at least half a year. In countries where the religiously unaffiliated make up a large share of the population – that is, 20% or more – differences in educational attainment between the youngest cohorts of unaffiliated and affiliated people are often small. For instance, there is a difference of less than half a year of schooling between the two groups in the United States, the United Kingdom, Germany, France, Australia, New Zealand, China, South Korea, Japan and the Czech Republic. In some countries, there are important educational differences within unaffiliated populations. Although data on the educational attainment of self-described atheists, who make up one category of religious “nones” (along with agnostics and people who describe their religion as “nothing in particular”), was not available for most countries in this report, analysis of survey data collected by Pew Research Center finds that atheists in the United States and France are significantly more likely than adults who say their religion is “nothing in particular” to have post-secondary degrees. But in Germany, Spain, United Kingdom, Australia, Uruguay and China, differences in post-secondary attainment between atheists and adults with no particular religion are not statistically significant. Gender differences in educational attainment among the unaffiliated are modest at the global level, except in terms of basic schooling: Women are more likely than men to have no formal schooling (13% vs. 4%). When it comes to average years of schooling, however, unaffiliated women lag behind unaffiliated men by less than one year (8.3 years vs. 9.2 years), and they are about as likely as men to have post-secondary degrees (15% vs. 16%). In the youngest generation, unaffiliated women are more likely than unaffiliated men to have higher education (25% vs. 22%) – a pattern seen in all regions except sub-Saharan Africa. By other measures of educational attainment as well, there are little to no gender differences in most regions. In Europe, unaffiliated men and women both average 12.0 years of schooling, and in North America, women and men have a similar number of years of schooling (13.4 years vs. 13.1 years). In Latin America, 54% of unaffiliated men and 57% of unaffiliated women have at least some secondary education. There is less gender equality in sub-Saharan Africa, where more unaffiliated men (27%) than women (17%) have at least some secondary education. The youngest generation of unaffiliated adults have more years of education, on average, than the oldest generation. Worldwide, they have gained 2.9 more years of schooling, on average, between the oldest generation (born 1936 to 1955), which has an average of 7.4 years of schooling, and the youngest (born 1976 to 1985), which has 10.3 years, on average. These global increases have been driven mainly by gains in the Asia-Pacific region, which saw the largest growth in average years of schooling among the unaffiliated of any region – a gain of 3.4 years, on average, across the three generations studied. Globally, the share of religious “nones” with no formal schooling has shrunk from 15% in the oldest generation to 2% in the youngest. In other words, nearly all (98%) religious “nones” in the youngest cohort have at least some formal schooling. Unaffiliated adults in sub-Saharan Africa saw the largest decline (26 points) in the share with no formal schooling across generations, from 67% in the oldest to 41% in the youngest. There also are notable generational differences in Latin America and the Caribbean and the Asia-Pacific region (16 points in both regions). Religiously unaffiliated adults worldwide also have seen increases in higher education, as the share with post-secondary degrees doubled from 12% in the oldest cohort to 24% in the youngest. The largest increase has been in the Asia-Pacific region, where the share with higher education rose by 13 points – to 20% – across generations. Still, the youngest generation of unaffiliated adults in the Asia-Pacific region are only about half as likely as their peers in Europe and North America to have post-secondary degrees (20% in Asia-Pacific compared with 39% in Europe and 45% in North America). China’s 700.7 million religious “nones” make up the largest unaffiliated population in the world – and 82% of the Asia-Pacific region’s unaffiliated population. Because of this, China’s patterns of educational attainment have an overwhelming impact on the data when measuring attainment levels across the region. But the educational patterns among religious “nones” in China are very different from those in other countries in the Asia-Pacific region, so it is illuminating to look at them separately. Most notably, while China’s unaffiliated have made big gains in secondary schooling, the rest of Asia-Pacific’s religious “nones” have made gains in higher education. A majority of adults in the youngest generation of “nones” in the Asia-Pacific region (outside of China) have post-secondary degrees (54%). In fact, five of the seven countries and territories where the unaffiliated made the greatest gains in higher education in recent generations are in Asia: Singapore, South Korea, Japan, Hong Kong and Taiwan.22 For example, people in the youngest generation of religious “nones” in South Korea are roughly five times more likely than those in the oldest generation to have a post-secondary education (54% vs. 10%). Some of these gains can be tied directly to the rapidly increasing educational attainment of unaffiliated women. For example, in Japan, the share of unaffiliated women with higher education rose from 16% in the oldest generation to 59% in the youngest, a 43-point increase. (The share of unaffiliated Japanese men with post-secondary degrees rose from 27% to 53%, a 26-point rise.) And in South Korea, the share of unaffiliated women with higher education rose 53 percentage points (from 4% to 57%). As a result of the strong gains made by unaffiliated women, the gender gap in higher education among the unaffiliated has reversed in Japan, South Korea, Mongolia and Hong Kong, so that women in the youngest generation are more likely than their male counterparts to have post-secondary degrees. In Singapore, unaffiliated women saw the largest gain in higher education across generations – 61 points, from 26% in the oldest generation to 86% in the youngest generation. This dramatic increase in higher education among women substantially narrowed the gender gap in the youngest generation (88% of men vs. 86% of women have post-secondary degrees). Across the three generations in this study, unaffiliated women have made more rapid gains than unaffiliated men at all levels of educational attainment. As a result, unaffiliated women in the youngest generation have closed the gap with men in average years of schooling and are more likely than men to have higher education. For example, unaffiliated women have gained 3.8 more years of schooling, on average, between the oldest and youngest generations. The oldest unaffiliated women have an average of 6.6 years of schooling, while the youngest have an average of 10.4 years. At the same time, unaffiliated men gained 2.2 more years of schooling – from 8.1 years of schooling for the oldest to 10.3 for the youngest. When it comes to higher education, unaffiliated women have made gains at a faster rate than men, increasing the share of those with post-secondary degrees from 10% in the study’s oldest generation to 25% in the youngest generation. At the same time, the share of unaffiliated men with post-secondary degrees went from 13% to 22%. In the United States, the only country in North America with available data on the youngest religious “nones,” unaffiliated women have become far more likely than their male counterparts to have higher education; a majority of unaffiliated women in the youngest generation in the study (56%) have post-secondary degrees, compared with 38% of their male counterparts.